Hey no dear Xenite friends, we haven't forgot you, because we are glad to announce you the Xenite Con' III ! Like the 2 previous years, the convention will be held on Saturday 25th and Sunday 26th of October, 2014 in Paris. 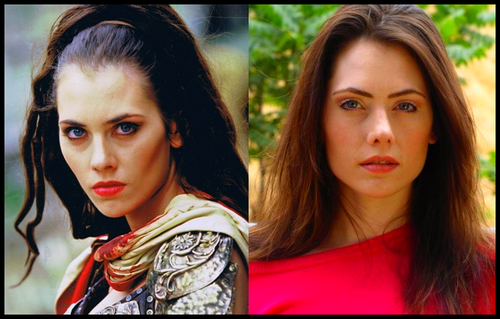 And the 1st guest is none other than the beautiful Adrienne Wilkinson, aka Eve/Livia in the show Xena: Warrior Princess! She is looking forward to come to meet you. This year, we increased the prices a little (but the payment via installments is still available) because we would very much like to get as guest you know who. And to do so, we have to sell a lot of pass and it can't be done without you. So you know what you have to do! The first 50 God Pass sold out, will give you a free access to the Saturday party. A private party where the guests will be present, in a very convivial and intimate atmosphere where they will reveal their true colors to you. 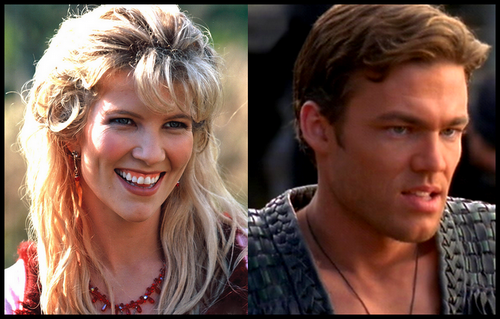 We are glad to announce you 2 exceptional guests for the Xenite Con' III, this is Alexandra Tydings (Aphrodite) and William Gregory Lee (Virgil) ! They are very happy to join us into this weekend which is going to be amazing for sure. Important point: Alexandra hasn't attended conventions or given any news to the Fans for years now, so you will have the chance to see her great come back during the convention! The online ticketing is finally available. The first 50 sold Pass God will give you access for free to the Saturday Party. A private party where the guests will be present in a very convivial and intimate atmosphere where they will reveal themself to you. You have always dreamt to meet those exceptional guests? So do not wait any longer, the pass are only waiting for you! The venue of the convention will be also announced soon. We are glad to announce you a 4th guest for the Xenite Con' III, this is the amazing Lucy Lawless aka Xena on the TV show Xena: Warrior Princess! You were dreaming of that for years? Well, now this is a reality! We are giving you the chance to meet the gorgeous Lucy Lawless, who hasn't attended an event in Europe for years. She is glad to come to meet her Fans for the first time in France! Lucy is an extra guest, meaning that she is not included in any of the pass, except the Titan (VIP) pass. But you can buy photo ops and autographs which are very limited. All of the pass except for the God pass, are not for sale anymore for the viability of the event. Please understand that Lucy is a guest of exception and it has a certain cost so, you will understand why her extras are at a "high" price. We are inviting all of the Xenites to buy their pass to make it even more real! We need you to make that event a success. So go on, enjoy it and make it possible together. Battle on! The 1st Titan Pass (VIP) has just been put up for auction in eBay! The auction will last 7 days. Access to the Saturday private party, with the presence of the guests. A gift offered (poster, derivative product…). So what are you waiting for? Bid and try to win that 1st VIP pass which will guarantee you to enjoy the Xenite Con' III at 100% ! You can pay by installments. The higher the price will be, the more installments you will have to pay the pass. We are proud to announce you a 5th guest for the Xenite Con' III, this is the gorgeous Hudson Leick aka Callisto on the show Xena: Warrior Princess! After having attended the 2 previous editions, Hudson has wanted to be with us again. For her, it's a tradition now! And as always, you could attend a Yoga and a Dance class with the beautiful lady. Hudson is an extra guest, meaning that she is not included in any pass, except for the Titan (VIP) pass. But you can buy photo-ops and autographs with her. Who has ever dreamt of a duo Xena/Callisto photo-op? Well, now it's possible! Find this very limited photo-op on the ticketing, as well as the extras with Hudson. We remind you that the 1st pass Titan (VIP) pass is still on auction, you have until Sunday evening. We invit all of the Xenites to take their pass! We need you to make that event a success. So go on and make it possible together. Battle on! So what are you waiting for? Bid and try to win that 2nd VIP pass which will guarantee you to enjoy the Xenite Con' III at 100% ! You can pay by installments. The higher the price will be, the more installments you will have to pay the pass. We are glad to announce you a new guest for the Xenite Con' III, this is the great Reneé O'Connor aka Gabrielle on the show Xena: Warrior Princess! Already present last year, she is very happy to have the opportunity to be with us again. Reneé is an extra guest, meaning that she is not included in any pass, except the Titan (VIP) pass. But you can buy the extras photo ops and autographs with her. For the 1st time in Europe, the Lucy & Reneé duo will be reunited! Who has ever dreamt of a Xena/Gabrielle photo op? Well, today, it's possible! Find this very limited photo op on the ticketing, as well as Reneé's extras. The 3rd Titan (VIP) pass has been put up for auctions, try to win it! However, we are sorry to announce you that William Gregory Lee won't attend the convention, because of a profesionnal reason (shooting). All of those who bought extras with him, please contact us on ticketing@xivents.com to give us your choices of substitution. The venue of the convention will be revealed in a few days! The Xenite Con' III will take place in Paris, in the Paris Marriott Rive Gauche Hotel! You can find on the page of the event all the informations about the venue and the hotels nearby, from the cheapest to the most expensive. There are few weeks left before you could meet all those extraordinary guests. We warn you that we are almost sold out, there is less than 100 pass still available. Hurry up! We remind you that the 3rd pass Titan (VIP) pass is still on auction. - The God Pass at 200€ is at 170€. - The photo-ops with Hudson Leick, Alexandra Tydings and Adrienne Wilkinson at 35€ are now at 25€, the photo-op with Reneé O'Connor at 45€ is at 35€ and the photo-op with Lucy Lawless at 70€ is at 55€. The duo photo-op Reneé/Alexandra at 70€ is at 50€, the duo Lucy/Reneé at 110€ is at 90€ and all the other Lucy Lawless duos are at a price of 75€. The group photo-op at 130€ is at 100€. 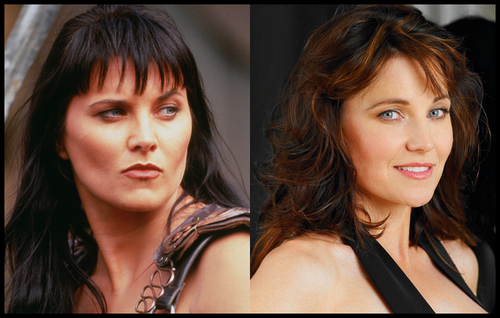 - The autographs at 25€ are now at 15€ and the autograph with Lucy Lawless at 30€ are at 20€. - The Meet&Greet with Hudson Leick, Alexandra Tydings and Adrienne Wilkinson at 60€ are now at 45€ and the one with Reneé O'Connor at 80€ is at 60€. Admit that for a surprise, it's a great surprise! You could indulge yourself lavishly (well, almost!). Hurry up and benefit from that promotion because it will only last 4 days from Sunday 12th to Thursfday 16th of October until midnight exactly. Then there will be the normal prices again. We also put up for sale the tickets for the Saturday party. The theme of the party is Cocktail Party, where all of the guests will be attending, except for Reneé O'Connor. During this party, you could talk and enjoy a warm and intimate moment with the guests. There will also be offered drinks (with alcohol and not) and some appetizers. You also could have fun on the dance floor, we are counting on you to set the dance floor on fire! If you do not wear a cosplay, please make an effort on your clothing, like something chic and classy, do justice to our beautiful guests! The ticketing will be closed on Monday 20th of October at midnight exactly and we will no longer accept payment via bank transfer from Thrusday 16th of October 2014.